A website that monitors Iran’s nuclear and missile programs, the entities contributing to those programs, and international efforts to impede Iran’s progress. The purpose of Iran Watch is to increase public awareness of the strategic situation in Iran and to make detailed knowledge of Iran’s weapon potential available to policymakers, the media, private scholars and the general public. 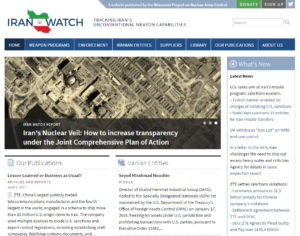 Iran Watch is a research resource, with thousands of primary source documents about the Iranian proliferation threat and the world’s response. It is also an advocacy platform, arguing for enhanced monitoring and verification of Iran’s nuclear program, a prohibition on strategic sales to Iran, and the strict enforcement of sanctions. Iran Watch is supported by grants from private foundations. The Wisconsin Project began work on Iran Watch in 2003, when Iran’s nuclear violations were first publicly reported. At that time, it was revealed thatIran was building a uranium enrichment plant at Natanz using illicitly acquired gas centrifuges and had conducted secret experiments to enrich uranium. It was further revealed that Iran was building heavy water facilities at Arak, which could one day provide Tehran with a source of plutonium, and that Iran had secretly separated small amounts of plutonium. Following these revelations, the International Atomic Energy Agency sought to uncover the scope of Iran’s past violations and its nuclear intentions. Disputes between the Agency and Iran sent the issue to the U.N. Security Council in 2006, and led to an increasingly stringent set of sanctions at the international and national levels. Iran Watch tracked and analyzed these developments. 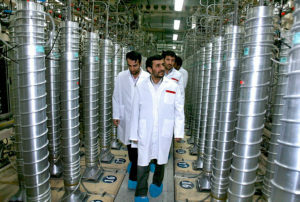 Through a number of op-eds and articles, the Wisconsin Project argued against Iran’s need to produce enriched uranium and warned about the proliferation risks inherent in such work. The Project also contributed to the expanding sanctions effort, by providing governments and companies with the names of entities in Iran contributing to the nuclear and missile programs. The Project’s work on Iran Watch When sanctions broadened beginning in 2010, targeting the Iranian economy as a whole, the Project was instrumental in ensuring that the Islamic Republic of Iran Shipping Lines (IRISL) was properly targeted, identifying front companies and new owners for IRISL’s fleet. The July 2015 Joint Comprehensive Plan of Action (JCPOA), the nuclear agreement between the P5+1 group of countries and Iran, shifted the world’s focus. Through Iran Watch, the Wisconsin Project tracked this shift, assessing the progress of nuclear negotiations and warning about problems with the emerging deal. Since the JCPOA took effect in January 2016, Iran Watch has focused on issues related to implementation, including: transparency questions, nuclear inspections, licit and illicit procurement, and the remaining missile and military sanctions. The Project is assessing different aspects of the JCPOA in a series of special reports, which are intended to raise awareness about its implementation and the Iranian threat among policymakers and the media. The first report, on transparency, was released in February 2017 (Iran’s Nuclear Veil: How to increase transparency under the Joint Comprehensive Plan of Action). The Editor and principal investigator for Iran Watch is Valerie Lincy, who is the Wisconsin Project’s Executive Director. Ms. Lincy created the website in 2003 and has overseen it since then. Her work on Iran Watch is supported by Gary Milhollin, who is the Project’s President and founder. Senior Associate Meghan Peri Crimmins conducts research and analysis on Iran sanctions issues and supports Iran-related outreach to policymakers. Senior Research Associate Matthew Godsey oversees the entity-related research that appears on Iran Watch. In addition, Iran Watch has benefited from the contributions of past researchers, including Simon Chin, Warren Marshall, Jerrica Goodson, and Mana Mostatabi.